Last week as I was reading through the Gospel account of Christ’s betrayal, arrest, and crucifixion, I was struck with how often this narrative exposes the mentality, nature, and tactics of abuse. This really should not surprise us because abuse is just plain sin. I think that it is in fact perhaps the most “diabolically beautiful” portraits of sin to be found. Its essence is the lust for power and control over — everything! It is the acting out of Satan’s declaration, “I will be like the Most High.” In other words, the abuser, like the devil, lusts to be God. Understand that and your eyes will be opened to everything else he does. 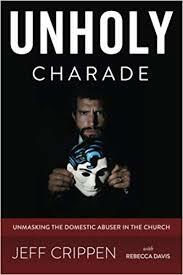 Abusers are most often people whom we believed to be our intimate friends, such as a spouse. Mat 26:31-46 Then Jesus said to them, “You will all fall away because of me this night. For it is written, ‘I will strike the shepherd, and the sheep of the flock will be scattered.’ (32) But after I am raised up, I will go before you to Galilee.” (33) Peter answered him, “Though they all fall away because of you, I will never fall away.” (34) Jesus said to him, “Truly, I tell you, this very night, before the rooster crows, you will deny me three times.” (35) Peter said to him, “Even if I must die with you, I will not deny you!” And all the disciples said the same. Many people will claim to stand with a victim against the abuser, but when push comes to shove, they don’t. Mat 26:47-50 While he was still speaking, Judas came, one of the twelve, and with him a great crowd with swords and clubs, from the chief priests and the elders of the people. (48) Now the betrayer had given them a sign, saying, “The one I will kiss is the man; seize him.” (49) And he came up to Jesus at once and said, “Greetings, Rabbi!” And he kissed him. (50) Jesus said to him, “Friend, do what you came to do.” Then they came up and laid hands on Jesus and seized him. The kiss of Judas. The abuser’s method of betrayal and abuse is so often couched behind a facade of “love” for the victim. Especially in the presence of witnesses. Mat 26:55-56 At that hour Jesus said to the crowds, “Have you come out as against a robber, with swords and clubs to capture me? Day after day I sat in the temple teaching, and you did not seize me. (56) But all this has taken place that the Scriptures of the prophets might be fulfilled.” Then all the disciples left him and fled. The abuser so often does his dirtiest work at “night” and brings out the most wicked forms of force and coercion at such times. He dares not show his real nature in the daylight. Once again, notice that no friends stand with the victim at such times. They all leave and flee. Mat 26:58 And Peter was following him at a distance, as far as the courtyard of the high priest, and going inside he sat with the guards to see the end. Following at a distance. How many of our friends do this? Not with us, but tagging along behind where they won’t suffer. Lies. False allegations. An active seeking of false charges so as to bring condemnation upon the victim. Notice also how these evil men used Jesus’ true and righteous words to condemn him. “Well, wife, is it not true that you said….”? The essence of abuse in regard to the innocent is murder. The abuser’s righteous victim must be destroyed because she KNOWS him and stands in the way of his quest for power, control, and deity. Notice also the tactics of mocking and the instilling of fear through physical assault. Mat 26:69-74 Now Peter was sitting outside in the courtyard. And a servant girl came up to him and said, “You also were with Jesus the Galilean.” (70) But he denied it before them all, saying, “I do not know what you mean.” (71) And when he went out to the entrance, another servant girl saw him, and she said to the bystanders, “This man was with Jesus of Nazareth.” (72) And again he denied it with an oath: “I do not know the man.” (73) After a little while the bystanders came up and said to Peter, “Certainly you too are one of them, for your accent betrays you.” (74) Then he began to invoke a curse on himself and to swear, “I do not know the man.” And immediately the rooster crowed. Miraculously, and only because Jesus had prayed for him, Peter would repent and return to Christ, the Lord Jesus later giving him a gracious opportunity to confess Him as Lord 3 times to counter Peter’s thrice denial of the same. But here, once again, someone very close to Jesus betrays Him, refusing to stand with Him in that darkest hour. (24) So when Pilate saw that he was gaining nothing, but rather that a riot was beginning, he took water and washed his hands before the crowd, saying, “I am innocent of this man’s blood; see to it yourselves.” (25) And all the people answered, “His blood be on us and on our children!” (26) Then he released for them Barabbas, and having scourged Jesus, delivered him to be crucified. (27) Then the soldiers of the governor took Jesus into the governor’s headquarters, and they gathered the whole battalion before him. (28) And they stripped him and put a scarlet robe on him, (29) and twisting together a crown of thorns, they put it on his head and put a reed in his right hand. And kneeling before him, they mocked him, saying, “Hail, King of the Jews!” (30) And they spit on him and took the reed and struck him on the head. (31) And when they had mocked him, they stripped him of the robe and put his own clothes on him and led him away to crucify him. The abuser works toward this end: that the wicked are justified and the righteous are condemned. See this horridly typical fact: the Son of God is crucified while the terrorist is set free and permitted full privileges. The tactic of mocking is seen here once again. Notice however the sobering self-judgment the abuser pronounces upon himself: “His blood be on us and on our children.” And so it is. Mat 27:39-44 And those who passed by derided him, wagging their heads (40) and saying, “You who would destroy the temple and rebuild it in three days, save yourself! If you are the Son of God, come down from the cross.” (41) So also the chief priests, with the scribes and elders, mocked him, saying, (42) “He saved others; he cannot save himself. He is the King of Israel; let him come down now from the cross, and we will believe in him. (43) He trusts in God; let God deliver him now, if he desires him. For he said, ‘I am the Son of God.’” (44) And the robbers who were crucified with him also reviled him in the same way. Here you have the public shaming of the victim, the slander and wagging heads and tongues. How often do we see this in so-called churches after a victim is shamed away? How often do such people claim that if the victim was truly righteous as she claims to be, then God would be on her side and all these bad things would not be happening to her. Mat 27:55-60 There were also many women there, looking on from a distance, who had followed Jesus from Galilee, ministering to him, (56) among whom were Mary Magdalene and Mary the mother of James and Joseph and the mother of the sons of Zebedee. (57) When it was evening, there came a rich man from Arimathea, named Joseph, who also was a disciple of Jesus. (58) He went to Pilate and asked for the body of Jesus. Then Pilate ordered it to be given to him. (59) And Joseph took the body and wrapped it in a clean linen shroud (60) and laid it in his own new tomb, which he had cut in the rock. And he rolled a great stone to the entrance of the tomb and went away. But in the end, there might be one, or two, or maybe 3 people who prove to be genuine friends of the victim. Take careful note that the most consistent friends of the mocked and crucified Jesus were women. Perhaps a more logical explanation is that they, and perhaps even Joseph, had suffered for following Jesus before, thus experiencing the evil of abuse themselves? Inevitably, these are the kind of people who will stand with us in the end. Last month we brought to your attention an immediate need of one of our readers regarding an unexpected tax bill. (Links to the original post and the update posts – first and final – are here for those of you who didn’t see those posts.) That need was met in only nine days. What a blessing your outpouring was to her. For safety reasons the abuse survivor needs to remain anonymous, but she wanted to express her gratitude so we putting it as a stand alone post so that as many as possible have a chance to see it. I would like to take a moment to thank everyone who participated in praying or giving toward the payment of my taxes this year. I am amazed at how God continues to provide for me in ways beyond anything I could expect or imagine. When I first began praying about this with my close friend, she reminded me that nothing is impossible for God. The struggles I face can be stressful and exasperating at times, but I also know that they cause me to have to rely on faith in God for my situation, more all the time, and that actually feels good to me to watch all the ways He cares for His own. I am praying God will return to all of you a one hundred fold blessing for your care and generosity and for His hand to meet every need you have in your life. My love and prayers are with you, always. May your celebration of Easter this year hold great blessing for all of you. Deuteronomy 10:17-18 For the LORD your God is God of gods and Lord of lords, the great, the mighty, and the awesome God, who is not partial and takes no bribe. (18) He executes justice for the fatherless and the widow, and loves the sojourner, giving him food and clothing. These few verses are just a small sampling of many others found in Scripture that repeat the very same theme – God commands us to render justice for and give care to the helpless and weak. Orphans and widows are prime examples. I would like to suggest to you that the victim of abuse classifies as a widow, and therefore the Lord expects us to provide her with justice and protection. Why do we call her a widow? Because her husband really is no husband. He is an oppressor and tormentor. Often, she is a “widow indeed” because her abuser has successfully alienated the rest of her family from her. If you have studied this subject of abuse much at all, you know that this phrase “left all alone, has set her hope on God and continues in prayers night and day…” is quite a good description of the Christian woman who is a victim of abuse.